Xabi Alonso became a global star at Liverpool and cemented his legendary legacy at Bayern Munich – but who else has crossed the red divide? Ahead of the legends match between the two clubs on Saturday, bundesliga.com picks out five players that captured the imaginations of fans at Anfield Road and in Munich alike… Click here to follow the legends match LIVE! This legendary Spanish midfielder is often remembered as “the last gentleman of football”, a more than well-deserved title. After breaking through Real Sociedad’s youth system, the Basque star propelled his boyhood club to a surprising second in La Liga for the 2002/03 campaign. After impressive performances for the txuri urdin over five seasons and becoming a regular for Spain’s national team, Alonso became a prime target for the European elite clubs. In 2004, he was seduced by his countryman Rafael Benitez’ Liverpool and immediately hit it off with Steven Gerrard in the Reds’ midfield. He was also a vital member of the legendary team that swept football fans across the world off their feet in the Champions League final against AC Milan. Alonso’s composure helped his teammates to stay in the game mentally and his 60th minute equaliser allowed them to dream the impossible and make football history. In 2009, Alonso left Liverpool to join a Real Madrid side that history will remember as the arch-nemesis of Leo Messi and Pep Guardiola’s Barcelona. In this period, the Catalans conquered a myriad of titles despite Real’s best efforts. El Clasico is always a tense affair and the pressure of having the two best players and the two best managers on opposing sides did nothing to improve this. Despite this, Alonso always maintained his ultra professional approach while looking to lead by example. After five seasons wearing the royal white strip and winning La Liga, Copa del Rey and Champions League titles, he signed for Bayern Munich in 2014. Although he was 33 at the time, his quality remained untouched and Pep Guardiola let the Basque maestro shine on yet another stage. 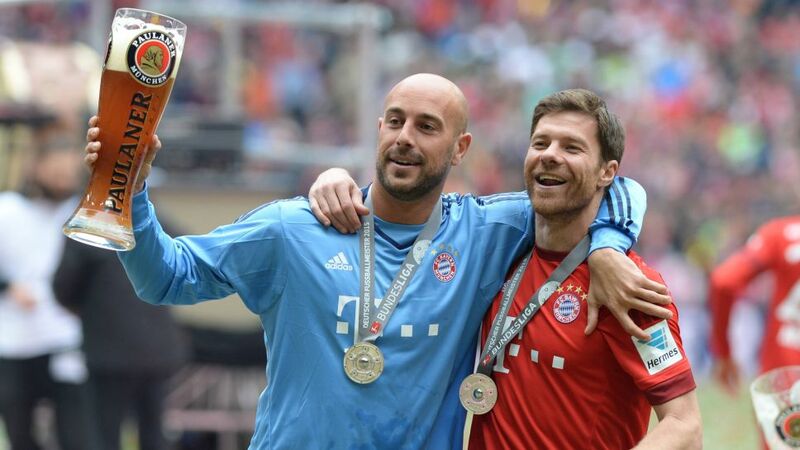 In his three seasons at Bayern, Alonso won the league title every year and retired in 2017 with a place the hearts of three European giants. After only one season of professional football under his belt, Can found himself at a crossroads in the summer of 2013. Although he was a 19-year-old treble winner after Jupp Heynckes had led Bayern Munich to Bundesliga, DFB Cup and UEFA Champions League glory, the competition for a regular spot in midfield was intense, with Bastian Schweinsteiger, Luiz Gustavo and Javi Martinez all above him in the pecking order. Although Can was part of Pep Guardiola’s plans when he took charge of Bayern for the 2013/14 season, the young midfielder agreed to join Bayer Leverkusen instead mere days before the league started. His performance with the Werkself that year drew the attention of many top European sides, but he ultimately chose Liverpool’s project to continue his career. Upon arrival at Merseyside, Can endured a difficult start to his Premier League career until the arrival of a familiar face to the Reds’ bench in 2015. Jürgen Klopp’s arrival not only brought fresh air to a side hungry for inspiration, but it allowed Can to flourish into an elite player. After many seasons playing in different positions, the Germany international found a home at defensive midfield in Klopp’s system. From there, he was instrumental during the 2016/17 campaign and even managed to score from an acrobatic bicycle kick which was selected as that year’s official Premier League Goal of the Season. After this dramatic title, Liverpool’s sporting project under Rafael Benitez became an attractive option for star players across Europe. Jose “Pepe” Reina was one of them. The charismatic goalkeeper was a product of FC Barcelona’s famous La Masia academy. After being dropped by the Catalans in 2002, he signed for Villareal, where he coincided with Diego Forlan and Juan Roman Riquelme to form a scrappy underdog squad that went on to mix it up with the big boys in Spain. Reina’s performances were crucial in this quest and the keeper eventually settled as his country’s best goalie not named Iker Casillas. After signing for Liverpool in 2005, he bumped Champions League winner Jerzy Dudek as the Reds’ default choice and made the Anfield side’s box his home for the next eight seasons. Although the Premier League title eluded Reina during his time in England, he enjoyed the support a loving crowd and became a Liverpool icon. His brightest hour came at the 2005/06 FA Cup final, where he saved three penalties to defeat West Ham in a dramatic game that only went into extra time after a 91st minute equaliser by Steven Gerrard. In 2013, a series of events that ultimately prevented him from rejoining boyhood club Barcelona led him to Napoli in the Serie A on loan. After a successful year in Southern Italy, he made a surprising move to Bayern Munich, where he couldn’t challenge Manuel Neuer for the starting spot, but he did write a little bit of history. With the first of his three Bundesliga starts, against Werder Bremen on Matchday 25, Reina became the first goalkeeper to play in Europe’s big four leagues. The following season, he returned to Napoli, where he is still the undisputed starter. “Didi” Hamann was part of the squad that won the 1993/94 Bundesliga title in his first top flight campaign at age 20. He saw little game time that season and remained under an amateur contract the following year, a decision the club would come to regret. The arrival of Giovanni Trapattoni as Bayern coach and a slew of injuries in midfield opened the doors of the first team for Hamann, whose lack of a professional contract inadvertently cost Bayern three points on Matchday 26 against Eintracht Frankfurt. The Bavarian giants were leading 3-2 when Hamann was subbed in at the 72nd minute. With Sven Scheuer, Sammy Kuffour and Marco Grimm already on the field, Bayern were now playing with four men under amateur contracts, a mistake that turned a 5-2 win on the pitch into a 2-0 defeat on the desks. Hamann eventually got his professional contract and went on to win the Bundesliga twice and the UEFA Cup in 1996 before joining Newcastle in 1998. After one season at St. James Park, he signed for Liverpool, where he spent seven successful seasons and endeared himself to the crowd with his performances at defensive midfield. Like Babbel, he took part in the 2001 cup treble, but his biggest contribution to the Red’s history came in the 2004/05 Champions League final against AC Milan, a game famously known as the Miracle of Istanbul. After trailing 3-0 at half-time against a side that boasted the likes of Andrea Pirlo, Kaká and Andriy Shevchenko all in their prime, The Reds mounted a valiant comeback, scoring three goals in the second half and winning the trophy in a dramatic penalty shootout. Hamann did not start the game due to a toe injury, but his half-time substitution was one of the main factors that fueled this epic tale. He was also first up on the Liverpool order in the penalty shootout and converted from the spot. Despite collecting a bounty of silverware with Bayern, Markus Babbel was a protagonist in one of the club’s most heartbreaking moments ever. He worked his way up through their academy, spent two seasons away at Hamburg and eventually became a regular starter at centre or right back, which is precisely where he played in the 1999 Champions League final against Manchester United. Bayern grabbed a 1-0 lead in the 6th minute thanks to a Mario Basler free-kick and remained in control throughout the match. They could already taste the champagne when Teddy Sheringham and Ole Gunnar Solskjaer turned the tide with two injury time goals. The whole Bayern squad broke down in tears after realising they’d entered the clubs history books for all the wrong reasons. In spite of that setback, Babbel still managed to win three Bundesliga titles, two DFB Cups and the 1995/96 UEFA Cup at Bayern. Add to to that list the Euro 1996 trophy with Germany and you get a sense of why Liverpool came knocking for his services for the 2000/01 season. In his first campaign at Anfield, Babbel proved crucial to win the UEFA Cup final against Alavés by opening the score in a 5-4 thriller that was decided in extra time under the old Golden Goal rule. That same year, Liverpool won the FA and League Cups and topped it off by taking the Community Shield over Manchester United and the UEFA Super Cup against Bayern. A rare muscle weakness disease forced Babbel to take a long break away from the game shortly after, but he overcame Guillain-Barré syndrome in 2003, turning out for Blackburn and later Stuttgart, where he finished his career in 2007.